Janeane Garofalo Defends Louis C.K. On The Latest 'Poptarts' Podcast And Things Get HEATED! Janeane Garofalo Defends Louis C.K. On The Latest "Poptarts" Podcast And Things Get HEATED! A master of fierce, feminist wit, Janeane Garofalo has been a comedy mainstay since the 1990s and is still making waves today. You may know her from her 25 years doing politically savvy stand-up comedy. You may recognize her from her roles on iconic TV shows including The Ben Stiller Show, The Larry Sanders Show, and Saturday Night Live. Or you may be a fan of her performances in such films as The Truth About Cats and Dogs, Wet Hot American Summer, The Matchmaker, Reality Bites, andSweethearts. Through every role Garofalo chooses, she telegraphs some truth about women’s lives, and in this interview, we asked her about her friendship with Louis C.K. (this was shortly after his first return to the stage at the Comedy Cellar in December, before his recent set in which he mocked trans folks and school-shooting survivors) and our discussion got surprisingly heated. You don’t want to miss this chat! 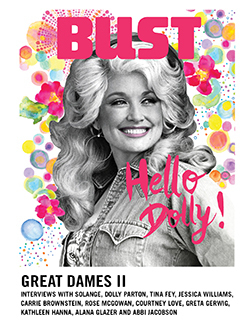 About: BUST's Poptarts is a twice-monthly podcast hosted by BUST Magazine editors Emily Rems and Callie Watts that celebrates women in pop culture. The first half of each episode is devoted to a hot topic in entertainment, and in the second half, a segment called "Whatcha Watchin'?," Callie and Emily dig into all the shows, movies, books, music, videos, and podcasts they've enjoyed since the last episode, and either praise or pan each experience. Check out every episode on iTunes, and don't forget to rate and review!